I first heard of Harriet Tubman while studying American history in grammar school. From that point on the terms “Harriet Tubman” and “Underground Railroad” were synonymous. Also, from that point on, Harriet Tubman became one of my all-time favorite heroines. So when I first considered writing a fiction series based on the lives of women in American history whose great faith and courage made a difference, it was no surprise that Ms. Tubman’s name rose to the top of my list. What was a surprise was discovering how very little I knew about her beyond the basics of her escape from slavery and her subsequent involvement in leading hundreds of others to freedom as well. It turns out that was just the tip of the proverbial iceberg. This lady had a multitude of fascinating—and often dangerous—experiences during her lifetime and was involved in all sorts of causes. 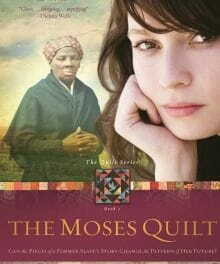 Because she was known as the “Moses of her people” and because each of the three stories in this new “Quilt Series” is told against the backdrop of a quilt, with various patches in the quilt representing different times or events in the historical character’s life, the first book was titled The Moses Quilt. Mimi, the elderly woman in the book who owns the Moses quilt, relays Harriet Tubman’s life to her great-granddaughter and her boyfriend through the quilt’s patches. The first patch depicted a tiny cradle and represented Harriet’s birth and very early childhood. But as Mimi explained to her enthralled listeners, there was no cradle for little Harriet when she first entered the world. Born in Madison, Maryland, in 1820 (some records say 1821 or 1822), Harriet was one of what is believed to have been a dozen siblings. The family lived in a tiny, windowless, dirt-floored cabin on the Brodas plantation, where slave children were put to work when they weren’t much more than toddlers. Harriet’s owners were especially brutal, and she learned at a very young age about beatings and humiliation and never enough to eat. But her parents, Harriet ("Rit") Green and Ben Ross, were godly people. Though illiterate and penniless, they made it a point to teach their children the Scriptures from memory and to model to them a loving and forgiving life. As a result, Harriet grew up feeling pity, rather than hatred, for her masters, despite the fact that she never had anything close to a normal childhood. Had I learned nothing more than that great truth about Harriet Tubman, it would have been enough…but there was so much more that came as a direct result of her faith and courage. The next patch in the Moses quilt that represented a major turning point in Harriet’s life was that of a two-pound weight. Harriet was thirteen years old and bone weary from working in the fields all day when she noticed something unusual—and alarming. A slave named Jim took what he thought was a chance to escape and raced for freedom, headed in the direction of town. But Harriet wasn’t the only one who saw Jim leave; the overseer spotted him too and took off after him. Harriet’s heart pounded at the thought of what would happen to Jim if the overseer caught him. Believing she could outrun the overseer and having a pretty good hunch of where the slave was headed, she took off in an attempt to warn him before it was too late. Unfortunately she didn’t make it. The two men were already facing off when she arrived. When the overseer saw Harriet, he told her to help him hold Jim while he whipped him. Harriet refused and instead stood between the two men so Jim would have a chance to escape. The overseer was so mad that he picked up a piece of lead and hurled it at her, hitting her in the forehead and knocking her out. Her skull was fractured, and though she eventually recovered, the dent in her forehead was a permanent reminder of the price she had paid in her first attempt to help free a slave. She also developed an ongoing condition that caused her to drop off to sleep for short periods, regardless of what she might be doing at the time. My respect level for Harriet Tubman rose greatly at that point, for I realized how easily she could have allowed that incident to force her to cower in submission to the men who claimed to own her. But she didn’t. Instead she determined to devote her life to fleeing for freedom and helping others do the same, having come to the belief that it was what God had purposed for her to do. Isaiah 16:3 quickly became one of her favorite verses, and she repeated it often: “Hide the fugitives, do not betray the refugees.” Her life’s path had been established. And then there was the patch with the two white bells and a broom. Sounds like a strange combination unless you know the tradition of the time. Because slaves were unable to have traditional wedding ceremonies where they pledged before a minister to live together “till death do us part” because their owners could sell one of the other of them anytime they wished, their “broomstick ceremonies” were simple affairs, usually held in the slave quarters. The couple “jumped the broomstick” and pledged their love to one another, hoping they would indeed have as long a life together as possible. And that’s exactly the way Harriet’s uniting took place with John Tubman in 1844. Harriet was deeply in love with John and thought her life had taken a turn for the better. John, however, was a former slave, “free” in that no one owned him any longer, but still he lived in the slave quarters and worked alongside them. Harriet imagined that John would therefore understand better than anyone her burning desire to escape slavery. Sadly, that was not the case. The next patch was of a bird behind bars. And that’s how Harriet felt, even as she came to realize that if she escaped, she would have to leave her beloved John behind. He informed her in no certain terms that he wasn’t willing to take such a risk and that if he found out she was going to try it, he would report her to the master. Harriet was heartbroken, and yet her yearning for freedom and her commitment to fulfill what she believed God had called her to do pushed her onward. Finally, one warm summer evening in 1849, Harriet wrapped a meager amount of food in a bandana and prepared to slip away during the night with her two brothers. They didn’t even tell their parents for fear of word leaking out. But the trip was so dangerous and difficult that it wasn’t long before Harriet’s brothers turned back and she was left alone on her journey to freedom. But she prayed and pressed on, believing God to lead her every step of the way. And so He did. She made her first Underground Railroad contact early on in her trip and soon received assistance and direction along the way. Exhausted and nearly starved, she finally stepped across the Pennsylvania line and knew that she was free. She had no idea where she would live or how she would support herself or even find something to eat, but she compared her newfound sense of freedom to being in heaven. She had given up everything familiar and beloved to her, but she had fulfilled her dream of escaping slavery. Would that finally be enough to satisfy her? Not at all. Though Underground Railroad connections helped her find a place to live and a job as a cook and cleaning woman and seamstress, her heart yearned for those she had left behind, still caught in the darkness and evil of slavery. She knew she could never rest until she did whatever she could to help them escape. The next patch on the quilt showed a gold coin, representing the continued cost of financing Harriet’s nineteen trips back and forth to the South to lead out some 300 slaves, including her elderly parents. Nearly every dime she earned working, combined with donations from sympathetic abolitionists, went to cover the cost of her dangerous trips. But Harriet never swerved from her mission, and she never lost one slave along the way. Some of the more surprising things I learned about Harriet Tubman included that she served as both a nurse and a spy for the Union Army during the Civil War, and was later actively involved with the women’s suffrage movement. She met famous people from all walks of life and earned the respect of more than she ever knew. When she finally died of pneumonia in 1913, she left behind a legacy of faith and courage—and peacemaking—that was epitomized in the final patch on the Moses quilt, a dove with an olive branch in its beak. Harriet Tubman, who gave so much and suffered so terribly, lived and died as a woman of peace, who longed to bring people together through unconditional love and forgiveness, even as she carried out some of the most daring rescue ventures of all time. I have indeed learned much from this great woman of faith and courage, this “Moses of her people,” and I pray I will honor her memory for as long as I live. Kathi Macias (www.kathimacias.com) is the multi award-winning author of 40 books, including the 2011 Golden Scrolls Novel of the Year, Red Ink. She lives in Southern California with her husband, Al.